As the web site says welcome to my scrap book of a web site, yes indeed it looks like a scrap book but the key is it’s so easy to navigate, a simple click on the “Read More” to enter and the site opens up. Now you find out why it is an Aladdins cave, there is so much information, every link leads on to more information, then more and more. 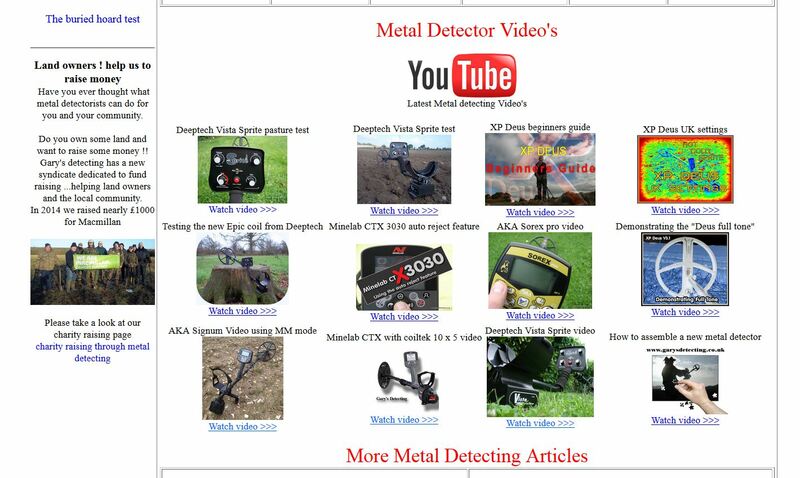 Apparently Garys metal detecting site was one of the very first websites to appear when the internet was in it’s infancy. All the reviews are written in an easy to understand format, nothing flashy and that’s how I like it, the reviews are not information overload but simple “step by step how to’s” and product information combined with quality images. So how did Gary’s detecting help with my detector search ? In a word knowledge in a very short time I was educated enough to go out there and make a decission based on my budget and the type of places I wanted to metal detect. Where to find a Sunday club, Bang it was there right on the bottom of the home page The Metal Detectives, not far from me and a great bunch who have a lot of respect for Gary and his team. How to assemble my new detector, there it is a step by step video right there in front of my eyes. I know Gary has had his health problems last year but I dont think he will appreciate me talking about something he may consider personal. My question is how does he find time to do this ? The real jewell in the crown is the Gary’s Detecting forum this is where the real metal detecting community begins. So I will wrap this up and say thanks for all the time and effort you guys have put into this hobby.